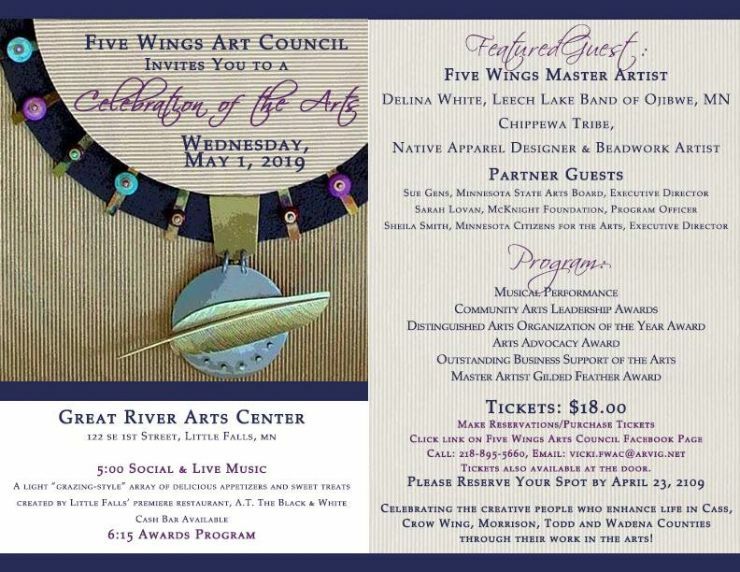 The Five Wings Arts Council Master Artist Award is given biannually to recognize an artist, living in Cass, Crow Wing, Morrison, Todd or Wadena Counties of central Minnesota, who has achieved creative excellence, a superior mastery of their art form, has accrued a reputable body of work, and has made important contributions to the arts. Nominations will be accepted for artists working in any artistic discipline, including but not limited to: visual arts (two and three dimensional), music, dance, writing, theater, film and media. All nominations must be submitted by June 7, 2017, 11:59 p.m. Anyone, with the exception of current Five Wings Arts Council staff and board members, may nominate an artist. Self nominations will also be accepted. Nomination forms, along with required support materials, must be submitted by 11:59 p.m. June 7, 2017. All nominations will be reviewed by a panel comprised of FWAC board members and staff. The panel’s recommendation is reviewed and approved by the FWAC board. All nominators will be informed of the decision regarding their nomination by July 15th. Click on the link to Online Grant Site, which can be found in the grey column on the right side of the home page. You will arrive at the Log On page. First, enter the email address you would like to have associated with this account. Once you have entered an email address and password, you will be taken to the registration page. You will first need to register to create an account for yourself, in order to submit your nomination. To register, complete all the required fields of information. Once you have completed the registration you will have a FWAC account, which you can access at any time by going to the FWAC Online Grant Site Log On page, entering your email address and password. You will not need to register again. Once registered you will have access to your dashboard. There you can find the nomination form by going to the “APPLY” tab, found on the left column. Click this and you will find the Master Artist Nomination Form at the top of the page. Click on Master Artist Nomination Form, and you will have access to the nomination form. Read and follow the instructions provided. Begin to complete the nomination form. If you do not have access to a computer, or lack experience in completing such forms, please call the FWAC staff at 877-654-2166. Enter your email address and password associated with this account. Click Log On. You will be taken to your account dashboard. There you will find the nomination form by going to the “APPLY” tab, found on the left column. Click this and you will find the Master Artist Nomination Form at the top of the page. Decisions are final and are not subject to appeal. The selection process will take approximately 3 weeks and all nominees will be notified of the panel’s decisions after the selections are made.